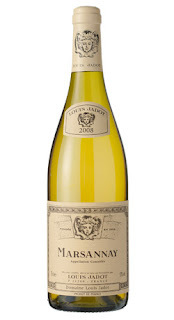 This Louis Jadot Marsannay Blanc 2008 is a step up from the basic Louis Jadot Bourgogne 2009 I reviewed recently. Served at cellar temperature, I decanted it around 30 minutes before our meal and reviewed it using two different glasses - a Royal Doulton and a Chateau Baccarat Oenology (for more on the glass review, see here). Straw-coloured in the glass, initially the nose is fairly restrained, mainly with aromas of oakiness - "stale washing", as a colleague once observed at a tasting. On the palate, the oak is again prominent in layers, but it does not feel completely harmonious just yet, but starts to come together much more after around an hour or so. Poured back into the bottle and re-sealed, we try it again the following day and this time everything is much more harmonious. The nose is still relatively muted, but the "washing" aromas have gone. The palate is leesy and savoury, with ripe, lemony-pineapple acidity, some lime-zest sharpness and hints of sweet nutmeg spice. There is also some toastiness on the mid-palate and finish which is persistent and savoury. Overall, it feels well-made with a good depth of flavour and will match well with autumnal food such as slow-roasted chicken, lighter game, or pasta with wild mushrooms in a creamy sauce. The price takes it well into "special occasion" territory and to get the best out of it requires quite a bit of time in the decanter and / or a couple more years' cellaring. £16.75 from Rhythm & Booze, slurp.co.uk, Islington Wine, Well Wines, Bacchus et al., Booze Bargains, Matthew Clark; provided for review.